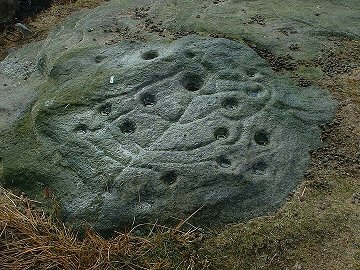 This rock carving is situated on the east side of Snowden Carr just before a fieldwall. 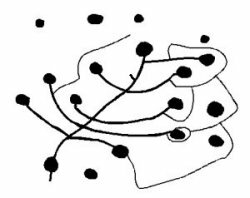 A low flattish boulder has around 18 cup marks with 11 of them linked with grooves to a central 'stem' resembling a leaf or a tree, hence the stones name, with other interlinking grooves around parts of the design. 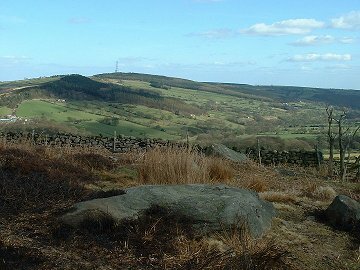 Although this is quite a long rock, the carving are confined to the eastern end (there are a couple of simple cups on the western end), This could have be due to the view looking in this direction over the Washburn valley with the river curving away to the left and right, and the hill of Norwood Edge straight ahead. This ancient view has been altered in modern times with Swinsty Reservoir now to the left with Menwith Hill's radar golfballs beyond it, and a large radio mast on top of Norwood Edge. It could be that the carving in some way represents a plan of the springs and streams of the area leading into the river. See also Snowden Carr and Death's Head Rock pages.